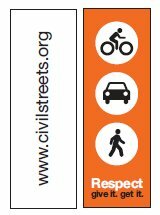 Take Action - Civil Streets! Help get the word out in your neighborhood. 10 Stickers or more: .70 each/ 100 or more stickers $ .60 each. Help make our roads a little friendlier. No Stickers in your city yet? Want to be a distributor? Email us!